Planning a trip to Congaree National Park in South Carolina? Check out these top things to do at Congaree National Park! You can see why the park was created to protect the largest intact expanse of old growth bottomland hardwood forest remaining in the southeastern United States. 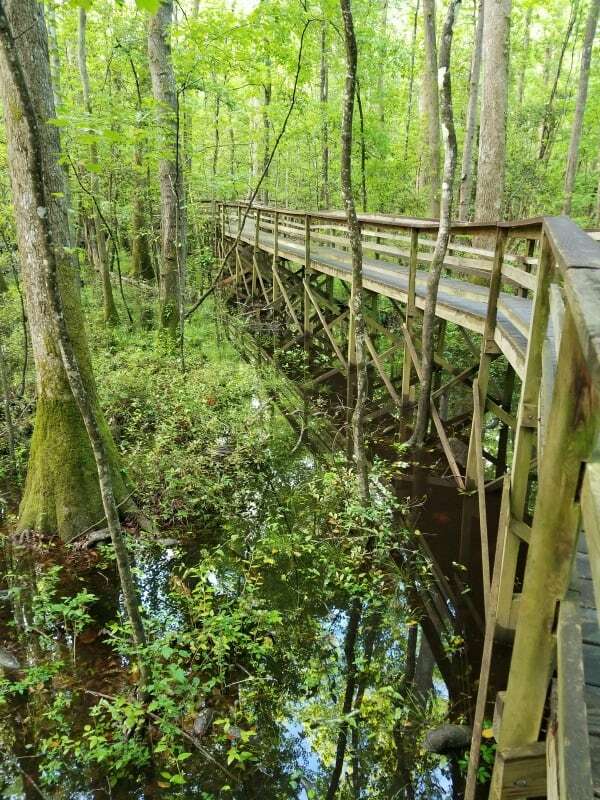 One thing to remember when visiting Congaree NP is the park is humid and can be buggy! Be prepared for the weather, humidity, and bugs during your visit. You will want to dress in layers as the park heats up as the sun rises. We started our visit early in the morning and by the time it was noon we were really glad we had multiple layers of clothes. The morning was lovely and the afternoon was warm and humid! There is a mosquito/bug meter at the visitor center that goes from mild to a war zone. Take note of it near the bathrooms at the visitor center so you know what to expect when you head out in the park. 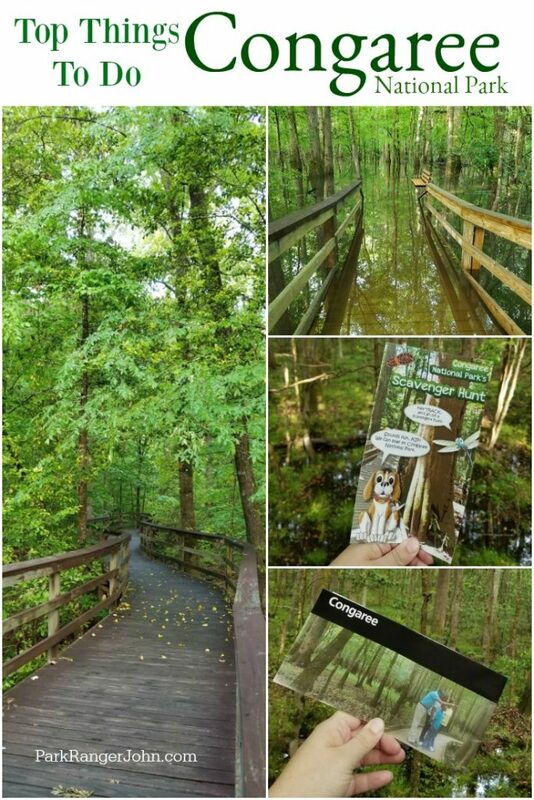 Reader suggestions for favorite things to do at Congaree NP! 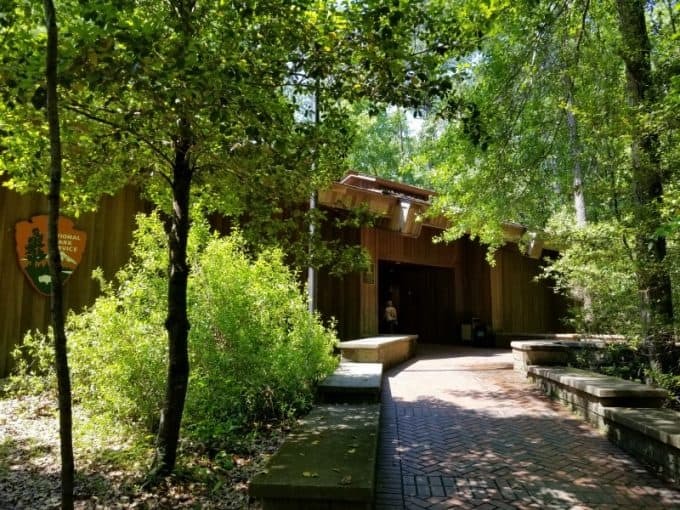 The Congaree Visitor Center is a great place to start your visit to Congaree NP. The visitor center displays explain why the park floods, the importance of the bottomland hardwood forests and how the park was created. You can also pick up a Junior Ranger program, check for ranger programs and watch the park video. 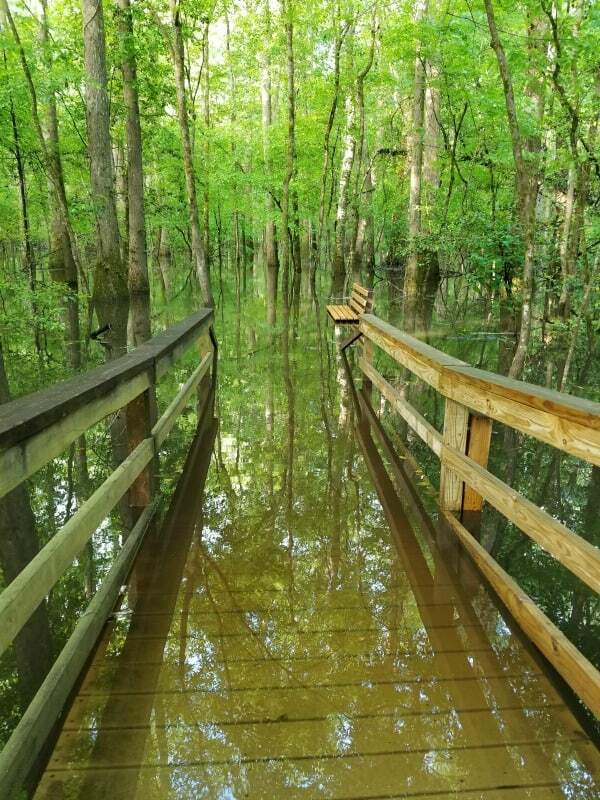 Seeing Congaree NP flooded is a unique way to see the park. The boardwalks are partially covered in water making for a different way to see the park. The boardwalk trail is the perfect way to explore this gorgeous park. Depending on the time of year the boardwalk trail may be flooded so you can’t complete the full loop. You can still access a large portion of the boardwalk trail and explore the park even when it is flooded. Throughout the year rangers and volunteers lead guided tours through the park. This is a fantastic way to learn more about the park and be able to ask questions as you explore. Check the schedule of events to see what is scheduled during your visit. Each year Congaree offers free Ranger-guided canoe tours of the park. You can find out the dates of the tours on the National Park website. Participants must be able to swim without the aid of a flotation device. Children 6 and older are permitted when accompanied by an adult 18 years or older. Each canoe must have one participant who has prior experience paddling canoes or kayaks. The Cedar Creek Canoe Trail winds approximately 15 miles through the Congaree Wilderness and is a great way to see a different part of park. The park does not rent canoes or kayaks. You will need to bring your own or rent one in Columbia, South Carolina. Make sure you stick to the middle of the river to prevent bugs or snakes dropping down from trees into your canoe or kayak. This is definitely not the way you want to meet some of the local wildlife. For a couple of short weeks in Spring, you can view synchronous fireflies at Congaree NP! The park provides updates and information on timing, trails that are set up for prime viewing, and premium viewing times. Check out the fireflies page for more info. The junior ranger program at Congaree can easily be done during one visit to the park. 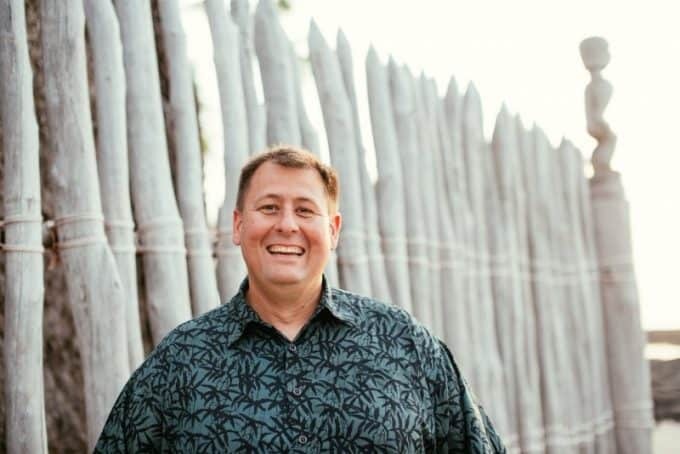 A portion of the program can be completed in the visitor center with the remainder of the program focused on things you see while walking the boardwalk trail. Congaree is a pet-friendly park and you can easily take your dog for a walk on a leash on the boardwalk trail. We saw a lot of park visitors with their dogs during our visit. While we did not get to see them sadly, the rangers showed us amazing photos of Barred Owls sitting on tree stumps not far off the boardwalk trail. We also heard warblers and saw Cardinals during our visit. Congaree has a couple of campgrounds including a hike in campgrounds. The campgrounds are located near the front entrance of the park. This is a great way to see more of the park and spend time exploring the trails. 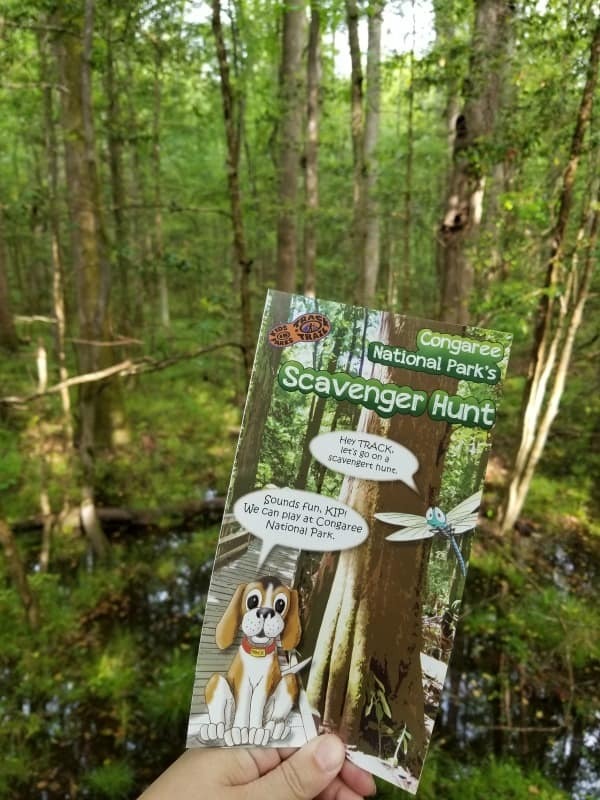 There are a ton of great things to do at Congaree NP! Do you have a favorite thing to do at Congaree? We can’t wait to explore this park again and see more of the park.